On Friday 15th December 2017, The Engineering College hosted their second annual Christmas Fundraiser in support of Evolve North West, a local charity in Wirral that aims to support and inform young people and adults of the risks of volatile substances. The event commenced at 09:00am where thirteen teams, including staff and students competed in the ‘Know it all Showdown’ quiz. The winning team (The Eggheads) were presented with a Trophy and vouchers. 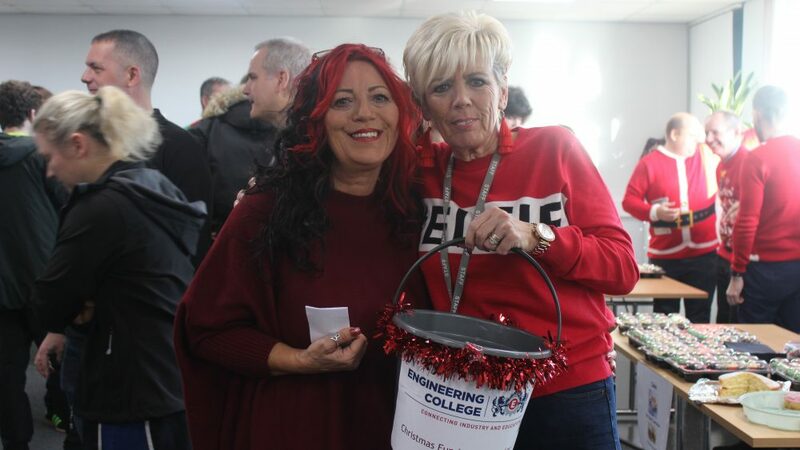 Throughout the morning, staff from The Engineering College along with a number of Learner Council Representatives, hosted a number of activities, including; breakfast and cake sale stalls, tombola, guess the weight, a darts competition, and a grand raffle. This year, we raised in excess of £1,400 to support this years’ nominated charity, Evolve North West. Whilst Evolve is a not for profit organisation, it provides preventative education, early intervention, counselling, family support and training for professionals, in relation to the abuse of former Legal Highs, especially Volatile Substances. Our team would like to thank all companies and students for their donations, including Cammell Laird, and Balfour Beatty (electrical department), who made very generous cash donations. The team would also like to thank Yesss Electrical, who hosted an engineering stall and raffle that generated more than £80 and local business No.32 who donated free breakfasts to be sold to raise money and gift vouchers to be included in the grand raffle. Thank you to all students, staff and employers who supported this event and helped to raise such a fantastic amount of money for a fantastic cause.